On the plus side, I have been getting a lot more social experiences in this month. We've started a weekly movie night at our friends' house on Wednesdays, a board game night on Fridays with the couple across the street, a poker night with the guys, a fantasy-football-style game night for ABC's The Bachelorette (don't ask), and I joined a summer kickball league because, hey, what's more fun than playing kickball with grown adults in 105 degree heat? The original goal was to see if avoiding purchasing things and instead having experiences made me feel any happier than I normally would. I have to say, if I'm happier than normal, I am unfortunately not really noticing it. I feel about the same as normal; maybe even slightly worse than normal. That's not necessarily bad, because I'm generally pretty happy. People note that often I'm oddly smiling while doing things like working in front of a computer or walking through a grocery store. So, par for the course is pretty darned good. I'm just not getting the big jump in attitude I was hoping for. Maybe getting rid of things will help (another update is coming in a couple weeks). And it's possible that a month isn't nearly long enough to register any new positive feelings, or that I'm not properly measuring my happiness. For example, how I feel at a given moment while writing a blog post might be a poor methodology for judging the prior month. I could instead rate my happiness one-to-ten at the same time every day, and tabulate the ratings for a few months. (This would, of course, involve me doing extra work...so that's out.) It's also possible that I'm not much happier since we're hosting people over at our house more, and this involves me actually cleaning the house. On some level, I am sure that sweeping, mopping, and doing dishes are all in the top ten reasons we don't live in a state of nirvana. All in all though, I think the experiment was a little flawed from the start. 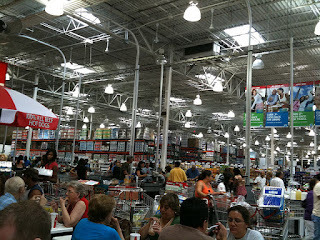 The Myths of Happiness claimed that purchasing experiences brought more happiness than purchasing things. In general, my fun experiences are nearly free: they involve the cost of a $7 bottle of wine or six-pack of beer, and these are kind of "things" anyway. Further, I didn't really shift my "buying things" dollars to "doing things" dollars. I just spent less, and hung out with friends more. I think the lesson I got out of this is that while I didn't necessarily gain greater happiness from avoiding buying things (because, hey, I did buy things), I learned that just hanging with friends is a way better way to spend your time and money...and I learned that on the cheap. 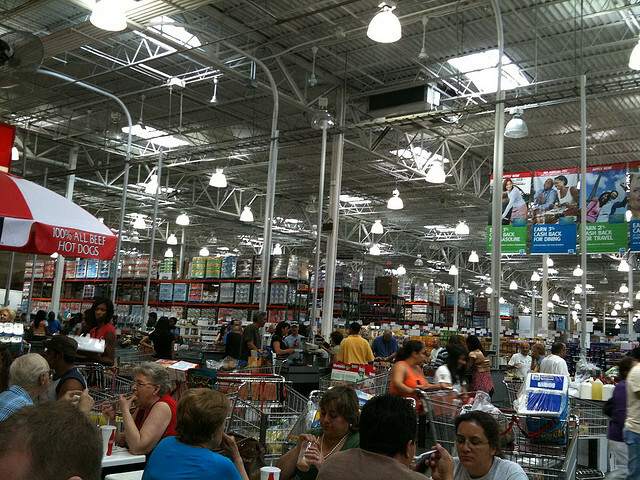 *Photo of the madness that is Costco is from miamism at Flickr Creative Commons.